Ecover Non-Bio Powder is powerful on ground in dirt, yet gentle on your skin and the environment. The new formula means that it performs even better at lower temperatures and offers brilliant results on whites and colourfast laundry. It has no optical brighteners, no enzymes and is made from plant based and mineral ingredients, with a fresh perfume scent. Get nature on your side. Originates in our clean, green factories. Plant-based & mineral ingredients. Naturally derived fragrance. Dermatologically tested for sensitive skin. Tackles tough stains even at 30°. Good Housekeeping Institute - approved 2014. UNEP award. Suitable for septic tanks. 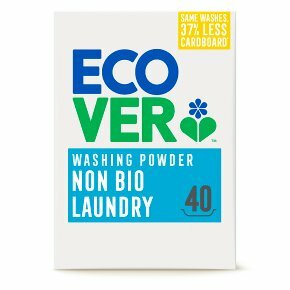 Cruelty-free international.Our non-bio washing powder is tough on stains, even at 30°, with no optical brighteners and a mild formula which is kind to your skin and our environment. Our famous ecological factories are energy efficient, sustainably built & clean running. So Ecover products have come from our clean, green home to yours. If you wonder why our products smell so nice, it's because we make the most of what our planet gives us... fresh naturally-derived fragrances. Our products have been dermatologically tested for sensitive skin so you can rest assured that using them will keep your clothes soft against your skin. WARNING. CAUSES SERIOUS EYE IRRITATION. CAUSES SKIN IRRITATION.<br><br>ECOVER NON-BIO WASHING POWDER<br>Keep out of reach of children. IF IN EYES: Rinse cautiously with water for several minutes. Remove contact lenses, if present and easy to do. Continue rinsing. If eye irritation persists: Get medical advice/attention. IF ON SKIN: Wash with plenty of water. If skin irritation occurs: Get medical advice/attention. If medical advice is needed, have product container or label at hand.